Am 13. 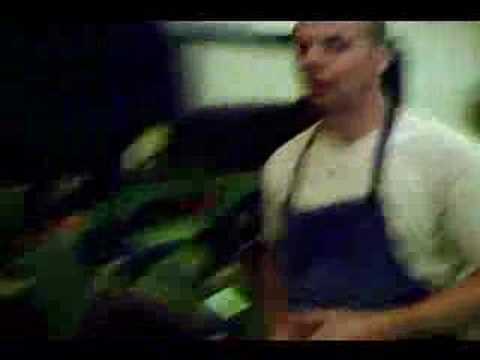 Juni 2007 fand in Danny's kickerparadies in Berlin die Auslosung der Paarungen der dritten Runde des TFVB-Pokals statt. 2:58 Min. 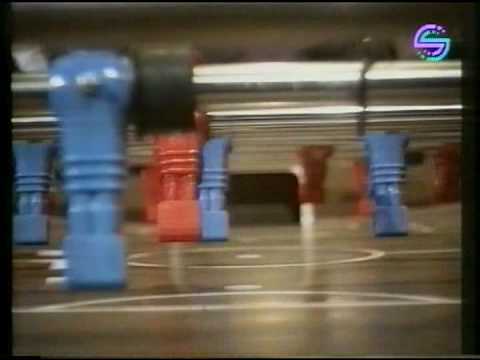 Cette vidéo montre le BabyFoot Bonzini b90, Baby-Foot pour particuliers de la marque française BONZINI. Le b90 est pratiquement le même que le b60, mais il ne possède pas de monnayeur, ni de retour central des balles. 2:26 Min. 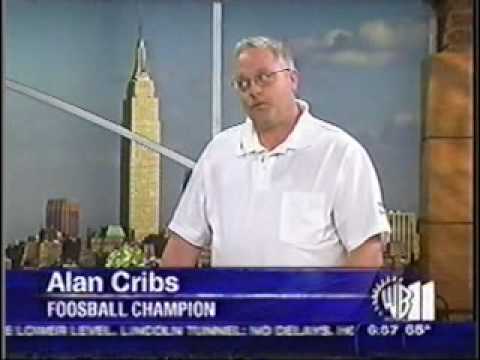 Bonzini U.S.A., President, Alan Cribbs on New York City WB11 Morning News Show, June 2006 2:48 Min. 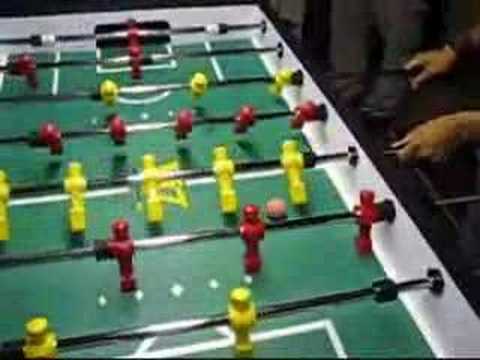 Descriptif du Baby Foot Bonzini Club. Ce baby-foot est basé sur la structure du B90, mais reprend le site de retour central des balles du Bonzini B60. 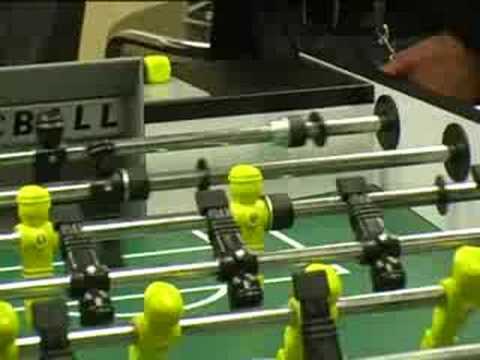 Ce magnifique baby foot est destiné aux particuliers. 1:26 Min. 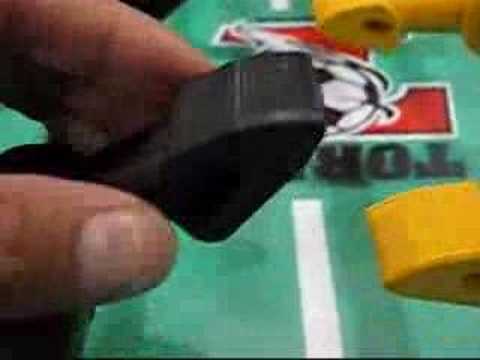 ?flix Libero: der kleinste Turnierkicker der Welt. 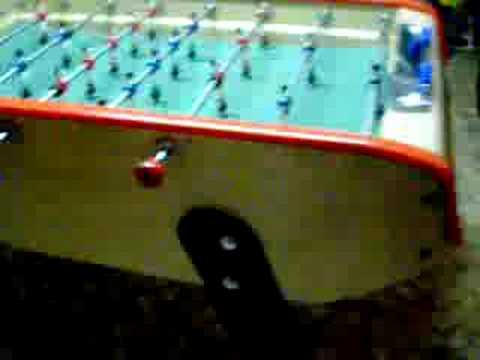 kicker table, soccer foosball, babyfoot, tischfußball, fußballtisch, Libero, 3:13 Min. 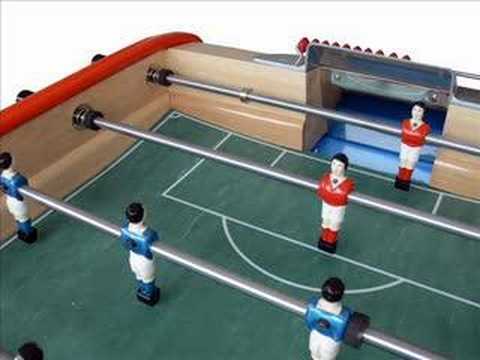 Yahoo foosball store? ?rod lock.?????!?? 0:49 Min. 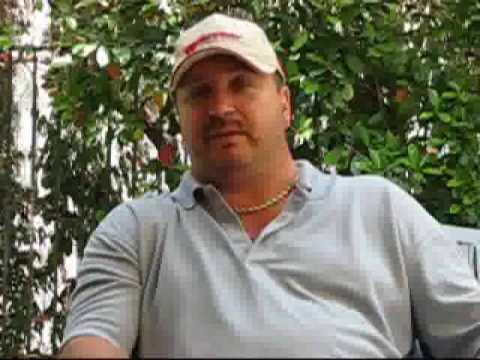 A little chat with Fredrico Collignon at the 2008 Hall Of Fame Classic in Las Vegas, Nevada. 3:28 Min. My Interview on TV NEWS 3:11 Min. 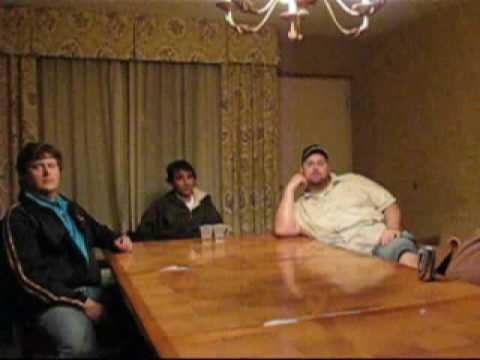 A candid discussion about current events in the world of professional table soccer with former world champions Dave Gummeson, Tommy Adkison, Terry Moore and curent world champion Todd Lofredo.. Part 1 of 5. 4:31 Min. 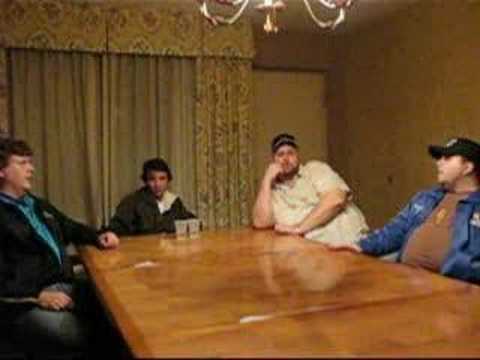 A candid discussion about current events in the world of professional table soccer with former world champions Dave Gummeson, Tommy Adkison, Terry Moore and curent world champion Todd Lofredo.. Part 2 of 5. 6:45 Min. 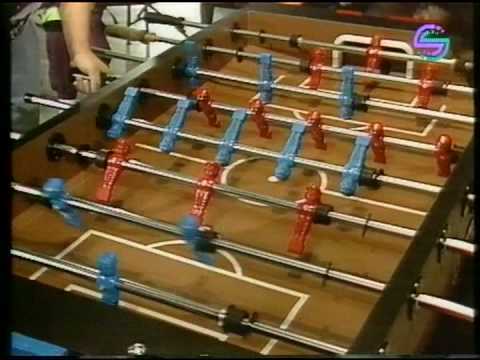 A candid discussion about current events in the world of professional table soccer with former world champions Dave Gummeson, Tommy Adkison, Terry Moore and curent world champion Todd Lofredo. Part 5 of 5. 4:14 Min. 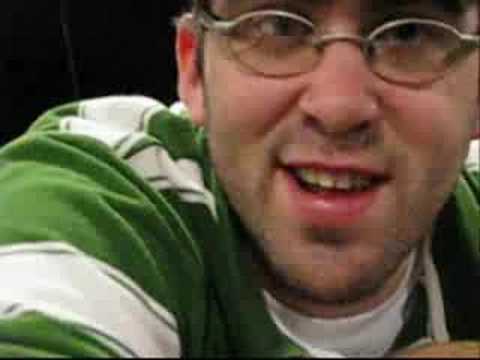 Billy Pappas, aka "mspappas", explains the meaning behind his nick name on the fooball forums. 1:04 Min. Part 1. These are clips of some of my friends from around the world. Some I have known for a while now and some are new friends. Most of them are the top Bonzini players from around the world. Friends include: Mr. Bonzini, Jean Benard Wernert, Koen with his hand song, Ishmael, Wendy, Tene - all from Belgium, French players, and UK britfoos with 'The Pink Peril', ITSF French Melanie, Algerians, and The Danes (Denmark). 5:42 Min. Part 2. These are clips of some of my friends from around the world. Some I have known for a while now and some are new friends. Most of them are the top Bonzini players from around the world. Players and countries include: Luxemburg, French, Canada, Algeria, Portugal, Germany Poland, Rob Atha, Ingrid - Belgium, and ITSF personnel. 6:30 Min. 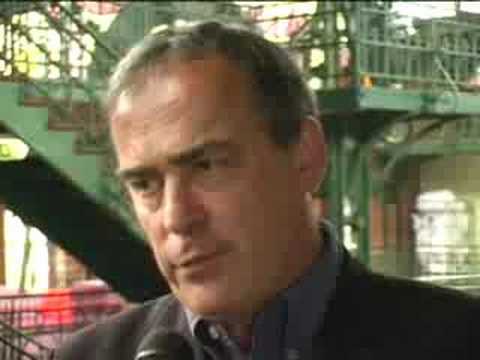 - 0.20 it was Jean-Bernard Wernet and his friend, they said :" My name is Jean-Bernard, I come from Strasbourg the Europeen Capital. 55 years ago, I was the French senior champion, and 12 years ago I was the second french double senior champion"... his friend Brigitte, she said :" I'm Jean-Bernard's friend and I think Jim Parris is very nice. It is a great chance for me to know him since some years and he is very nice. And I come frome Strasbourg too". - 2.57 it was Benrabah Feti, he said :" Hello Jim, I'm Benrabah Feti from Algeria. I am very happy to see you in Paris. I see you just few days a year but we are allways friend. 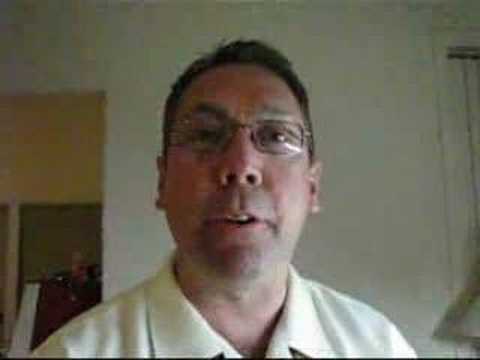 I remember very well your first participation because it was with me in 2006 Bonzini WWC, and I hope we are still friend". - 4.09 it was Paul Nunes, he said :"hello Jim, my friend, I am Paul Nunes, I want to congratulate you for your victory this week. And I want to say to you that you are a very, very good man". 6:02 Min. Part 4. These are clips of some of my friends from around the world. Some I have known for a while now and some are new friends. Most of them are the top Bonzini players from around the world. Players and countries include: Frederick Collignon, Ellen - Belgium, Petra - Hungary, Zeke Iceman Moore, Eric Fayolle, Lars Christenson - Denmark, Jim Stevens, France, Slovokia, Mike West, Bruce Nardoci, Tom Youre, Pat Ryan, and Rebecca Terry. 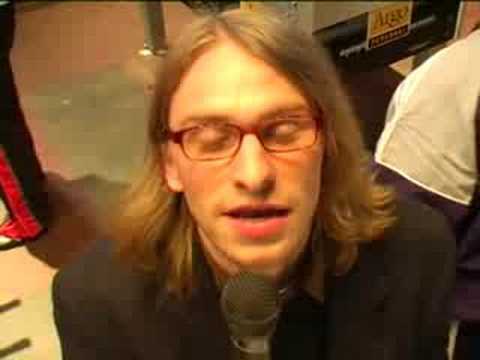 - 4.05 it was Fabien Mahy, he said :" Hello Jim, I'm Fabien Mahy from Paris. 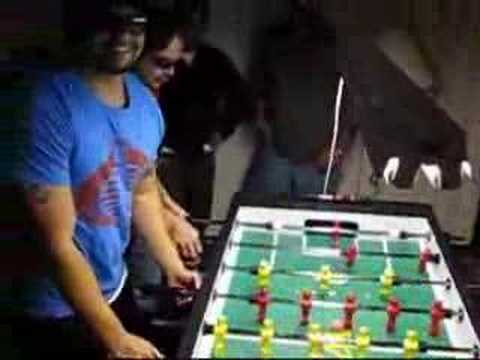 I am a foosball player and Jim Parris he is one of my great friend. I am very happy to see you this week-end, we have spent good time together and I hope I will can see you one more time, perhaps in a USA tournament". 6:44 Min. 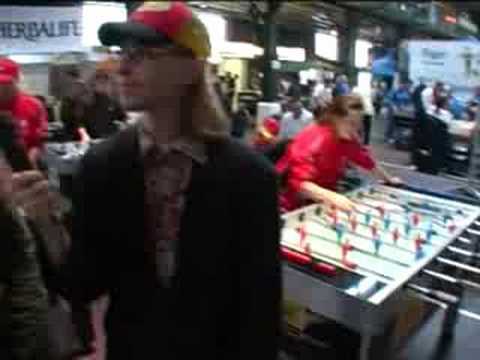 Adam Reid versucht auf einen SaXXot Tischkicker mit einem Bärenherzball einen Trickshot über zwei Fussballtische 4:35 Min. Preview of the new prototype Tornado tables. 2:42 Min. Evan Stachelek & Trevor Park take on Fernando DaRosa & Russ King on the Warrior prototype. To the winners go free airfair to Kentucky State! 7:51 Min. To the winners go free airfair to Kentucky State! 1:55 Min. To the winners go free airfair to Kentucky State! 3:06 Min. To the winners go free airfair to Kentucky State! 3:12 Min. A comparison between the Warrior man and the Tornado man. 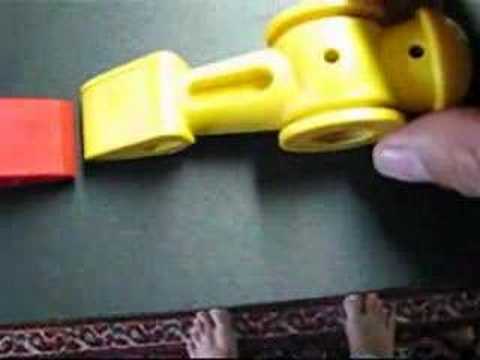 1:25 Min. Pt. 2 - IFP & Warrior Reach Agreement! 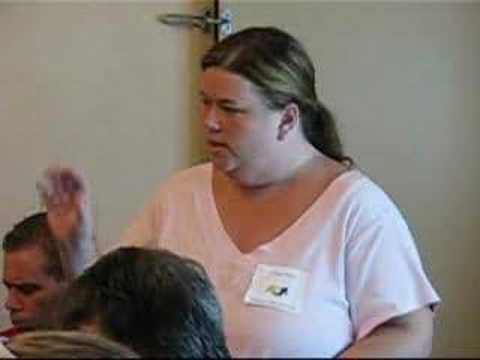 Mary Moore anounces that the IFP Tour will be switching over to the Warrior table! Starting at Kentucky State, The New Warrior Table will become the Official Table of The IFP Tour! 2:00 Min. Pt. 2 of 3 - Interview with Mary Moore & Brendan Flahrety. 5:40 Min. Pt. 3 - IFP & Warrior Reach Agreement! Starting at Kentucky State, The New Warrior Table will become the Official Table of The IFP Tour! 5:39 Min. Pt. 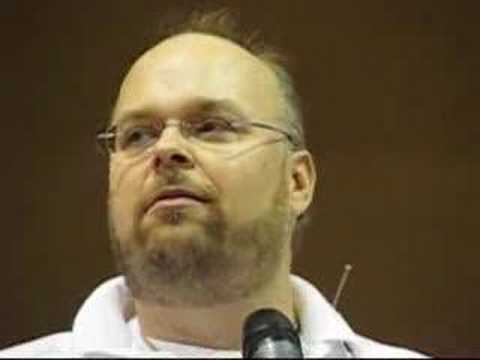 3 of 3 - Interview with Mary Moore & Brendan Flahrety 4:12 Min. 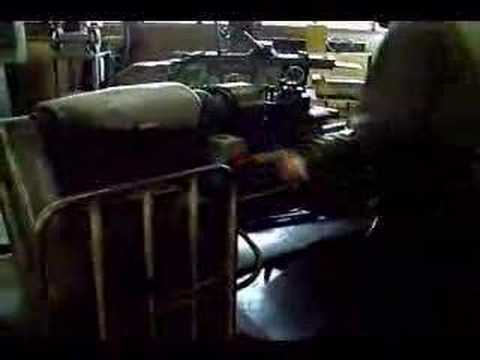 Pt.1 - IFP & Warrior Reach Agreement! Starting at Kentucky State, The New Warrior Table will become the Official Table of The IFP Tour! 3:13 Min. Pt. 1 of 3 - Interview with Mary Moore & Brendan Flahrety 5:40 Min. This 50 second Ad will explain Why the Best Players in the World use Rod Locks. 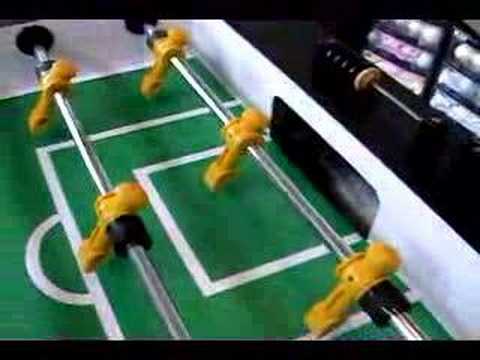 Rod Locks on your Foosball Table will improve your GAME. 0:53 Min. Interview RAI 1 7:09 Min. 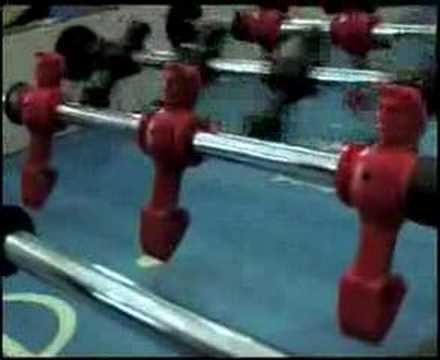 2007 China Open Table Soccer Championships in Beijing, China 5:53 Min. 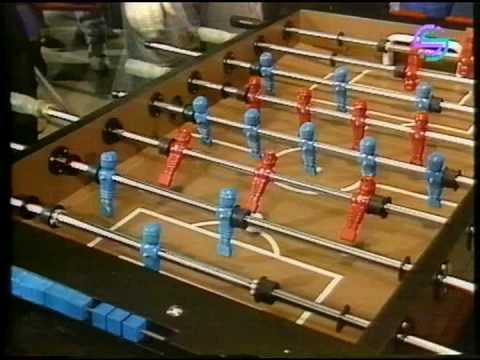 In an effort to answer some questions concerning the differences between the new Warrior Foosball table and the Tornado Foosball table, we have put together this side-by-side tale of the tape comparison video that we hope will be usefull and informative to all those concerned. 5:21 Min. 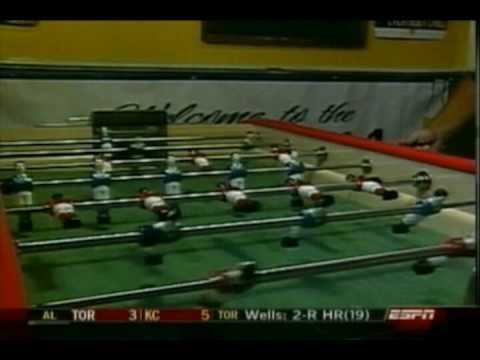 Terry Moore's induction into the Foosball Hall Of Fame at the 2008 Hall Of Fame Classic in Las Vegas, Nevada. 4. Gilberto Santoro (CH) 8:55 Min. 4. Gilberto Santoro (CH) 8:11 Min. 4. Gilberto Santoro (CH) 9:20 Min. 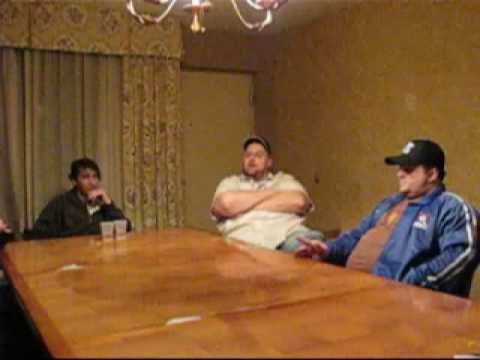 A candid discussion about current events in the world of professional table soccer with former world champions Dave Gummeson, Tommy Adkison, Terry Moore and curent world champion Todd Lofredo.. Part 3 of 5. 6:05 Min. 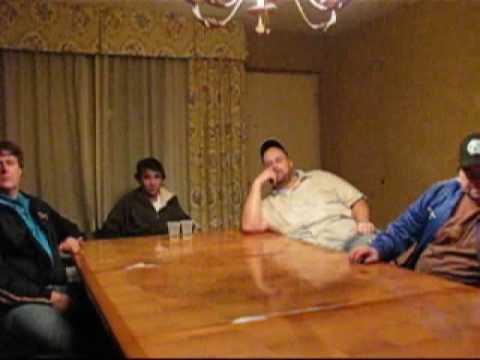 A candid discussion about current events in the world of professional table soccer with former world champions Dave Gummeson, Tommy Adkison, Terry Moore and curent world champion Todd Lofredo. Part 4 of 5. 4:06 Min. 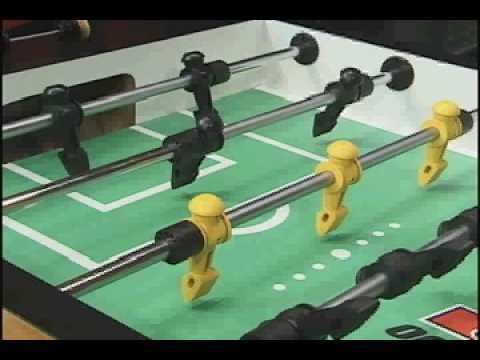 Mr. Bonzini took me and Mike Giles on a personal tour of the factory in Paris, France where the Bonzini foosball tables are hand made. 7:00 Min. Mr. Bonzini took me and Mike Giles on a personal tour of the factory in Paris, France where the Bonzini foosball tables are hand made. Part 2. 6:04 Min.